LIVE VIDEO: Storm Surge Forecast Issued For Key West - Joe.My.God. A “reasonable worst case scenario” forecast shows half of Key West underwater due to storm surge, according to a Weather Channel meteorologist. Hurricane Irma, a Category 3 storm as of 11 a.m., is predicted to turn away from Cuba and make landfall in the Sunshine State by Sunday morning. Forecasters say the eye is expected to make landfall in Key West. Officials and forecasters have warned of the dangers of “life-threatening” storm surge associated with the storm. 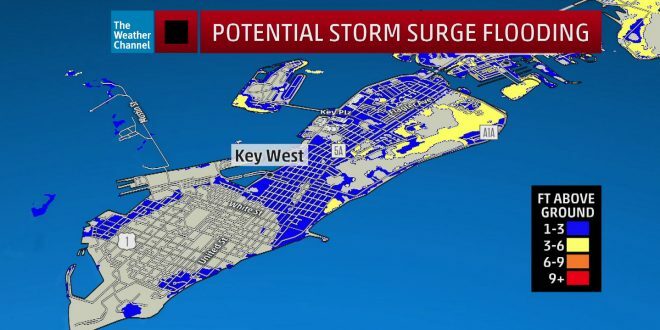 The graphic he shares shows large swaths of Key West under 1 to 3 feet of water. Key West sits at the end of a string of islands, or “Keys,” extending from the southern tip of the Florida peninsula. The National Weather Service predicts up to 5 to 10 feet of storm surge in the low-lying Florida Keys. This morning Towleroad posted the below live cams. The last one has to be viewed on YouTube and I’ve noticed a few idiots taking selfies in the middle of Duval.